This is a list of weapons served individually by the United States armed forces, sorted by type and current level of service. While the general understanding is that crew-served weapons require more than one person to operate them, there are important exceptions in the case of both squad automatic weapons (SAW) and sniper rifles. Within the Table of Organization and Equipment for both the United States Army and the U.S. Marine Corps, these two classes of weapons are understood to be crew-served, as the operator of the weapon (identified as a sniper or as a SAW gunner) has an assistant who carries additional ammunition and associated equipment, acts as a spotter, and is also fully qualified in the operation of the weapon. These weapons are listed under the List of crew-served weapons of the U.S. armed forces. The M1911A1 and M9 pistol. SIG Sauer M18 Modular Handgun System (P320 Carry) (9×19mm) – Was selected by the US Army to replace the M11 after winning the XM17 Modular Handgun System competition. Weapons from Vietnam and Desert Storm at the National Firearms Museum. A U.S. Marine armed with an M27 IAR affixed with ACOG Squad Day Optic. Remington Rolling Block rifle (a/k/a 1867 Rolling Block Remington .50-45 Centerfire). 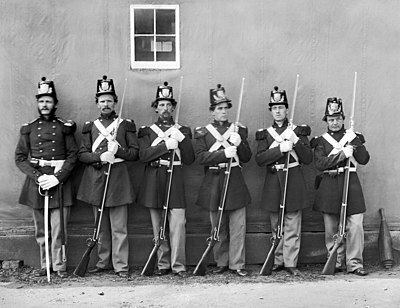 Five U.S. Marine Corps privates with fixed bayonets under the command of their noncommissioned officer, who displays his M1859 Marine NCO sword. Model 1840 Army Noncommissioned Officers' Sword A modern version of this sword with steel scabbard is currently permitted for wear by US Army platoon sergeants and first sergeants; in practice it is rarely seen outside the 3rd Infantry Regiment and honor guards. ^ "Titanium Knives, Military Survival Knives, Scuba Knives". Missionknives.com. Archived from the original on 2008-06-20. Retrieved 2008-09-08. ^ "LC-14-B Woodman's Pal". Military Tools with an Edge. Olive-Drab. Retrieved 2009-02-10. ^ a b Nalty, Bernard C. (1999). War in the Pacific: Pearl Harbor to Tokyo Bay: the Story of the Bitter Struggle in the Pacific Theater of World War II, Featuring Commissioned Photographs of Artifacts from All the Major Combatants. University of Oklahoma Press. p. 136. ISBN 978-0-8061-3199-3. ^ Bando, Mark (2001). 101st Airborne: The Screaming Eagles at Normandy. Zenith Imprint. p. 31. ISBN 978-0-7603-0855-4. ^ "M-1887 Hospital Corps Knife Basic Information". Hospital Corps Bolo Knives. The Springfield Edge. Retrieved 2009-02-09. ^ "M-1904 Hospital Corps Knife Basic Information". Hospital Corps Bolo Knives. The Springfield Edge. Retrieved 2009-02-09. ^ "M-1909 Bolo Knife Basic Information". Bolo Knives. The Springfield Edge. Retrieved 2009-02-09. ^ Levine, Bernard (September 1993). "World War I Bolo". National Knife Magazine. ^ "USMC Hospital Corpsman Knife". Military Tools with an Edge. Olive-Drab. Retrieved 2009-02-10. ^ "Machetes". Military Tools with an Edge. Olive-Drab. Retrieved 2009-02-10. ^ Schogol, Jeff (7 August 2017). "Marines opt for the 9 mil over 45s for special operators". marinecorpstimes.com. ^ "Mid-size Riot Control Disperser (MRCD), XM37". fas.org. ^ "National Firearms Museum: Ever Vigilant Gallery, Case 67 description". nramuseum.org. ^ Beekman, Christian (October 28, 2015). "Here's why the US military is replacing the M16". Business Insider. The M16A4 may soon retire. This week, the Marine Corps announced via internal memo that the M4 carbine will become the primary-issued rifle in infantry and security units, as well as replace the M16 rifle in supporting training schools by September 2016. ^ US Air Force Material Command. Air Force Instruction 36-2226, Combat Arms Program, Supplement 1. Wright-Patterson AFB: US Air Force Material Command, 2004. ^ Clark, James (13 June 2017). "These Marines Will Be The First To Get M320 Grenade Launchers". taskandpurpose.com. ^ "MODEL 1860 NAVAL CUTLASS". Goatlocker.org. 2007. Retrieved 28 December 2011. ^ Vice Admiral Mark Ferguson (January 2011). "R 252348Z JAN 11". Chief of Naval Operations. United States Navy. Retrieved 28 December 2011. This page was last edited on 20 April 2019, at 09:00 (UTC).